Dylan Ramirez pops the question. Dylan Ramirez was positive that the girl he loved — a girl named Celeste, with green eyes, a quick wit and a ton of energy — wanted nothing to do with him. He'd try to say "Hi" as they passed in the dining room of the retirement facility where they worked or near the time clock, as she left her shift and he started his. But he was tongue-tied. "I was really shy," he says. One day as they passed each other in silence on the front steps — she was leaving work, he was starting — the girl he loved broke the ice. "I said, 'You know, it's not a bad thing to say 'Hi' to somebody,'" Celeste recalls saying today. From that moment on, Dylan never missed an opportunity to talk to her again. In fact, he made excuses to be wherever she was. "After that, I don't know, I couldn't leave her alone, to be honest," he says. "I used to call him my stalker. Because wherever I was, I don't know, there he was!" Celeste says. "We'd even run into each other out in public and I'd be like, 'You're stalking me!'" "I wasn't interested in him at all for like the first year," she says. "But then he... I don't know, he kept pursuing me, and always made himself available, so that was a plus." He took her to a movie. They went for a walk in the park. They kissed on New Year's. Soon, Celeste found that she was thinking about Dylan all the time. He'd leave things at her place, just so he'd have a legitimate reason to drop by. "Persistence," Dylan says, looking at Celeste with a smile. After four years together, Dylan knew he wanted to marry her. But nothing felt right. Not a ring in a glass of Champagne or a dramatic movie proposal. "That's not good enough for her," he says. 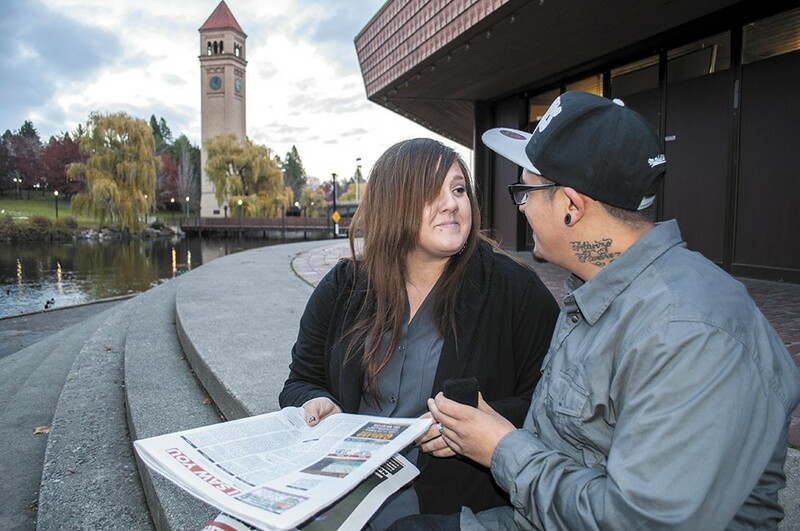 "One day I was passing by the Inlander, and I picked it up, and every time I pick it up, I always go to that back page and look at [the "I Saw You" page] first because it always reminds me of her." "I always read them. Like at work. It was just my thing," she explains. "I'm like, 'One day, you watch, someone will see me.'" She was right. Last November, Dylan told the world — or at least the people who read the Inlander — that he saw her. "I saw you over 2 years ago," he wrote. "It came to me very soon after us talking that you're my one and only, my soul mate my other half that I have been missing for so many years. I need you like I need air. Like a diabetic needs insulin, I love you like a fat kid loves cake. So I have to ask Celeste Christine Lennartz: will you marry me? And make me the luckiest man in the world?" She said yes. They tied the knot a month later in a simple ceremony. She wore a vintage dress and pearls; he wore a tie and slacks. They're complete opposites. He's shy, she's chatty. He likes to stay home, she likes to go out. He likes the Raiders, she likes Green Bay. Where some might be driven apart by their differences, for Dylan and Celeste Ramirez, meeting each other was like finding the other part of themselves that they'd lost. "More or less, we help the other one, complete each other. It just works," he says.